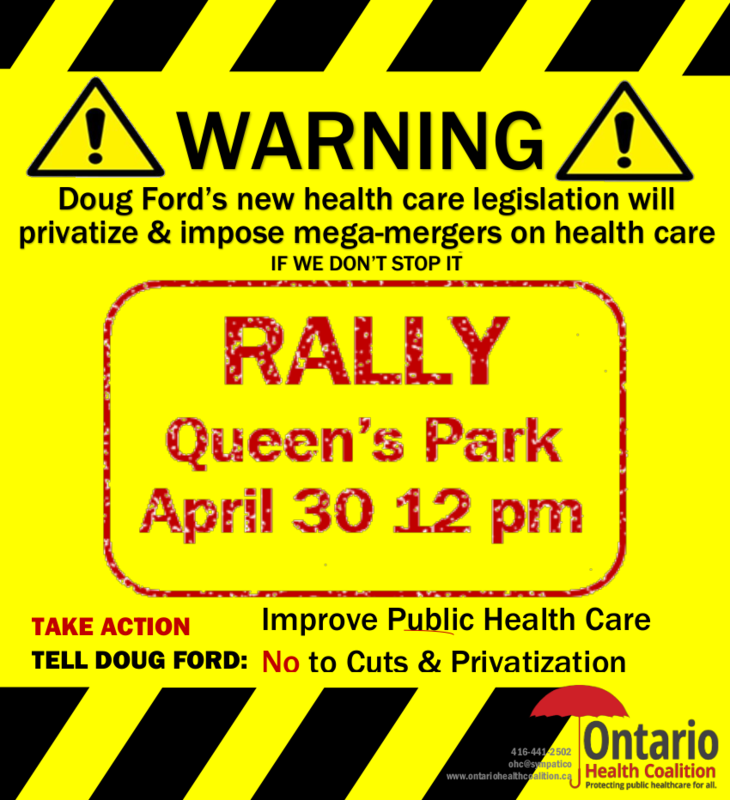 It is called “The People’s Health Care Act.” But the new healthcare omnibus bill, being rushed at breakneck speed through Ontario’s Legislature by Doug Ford’s majority caucus, does not reflect his promises to “the people” in the election. 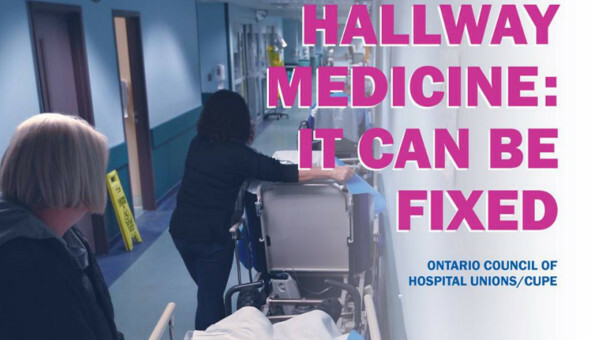 It does not open a single operating room (OR) to speed up surgical wait times, though lack of operating funds means that there are closed ORs in every major hospital in Ontario. It doesn’t add a single new nursing home space, nor one more nurse, health professional, or doctor. It doesn’t open any of the dozens of hospital wards, closed down as real-dollar funding has been tightened year after year. 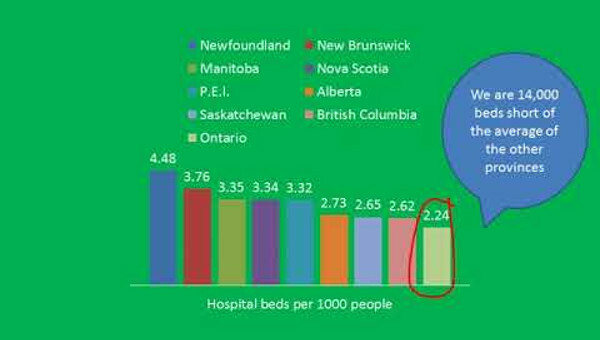 Yet Ontario has the fewest hospital beds left of any province in the country. 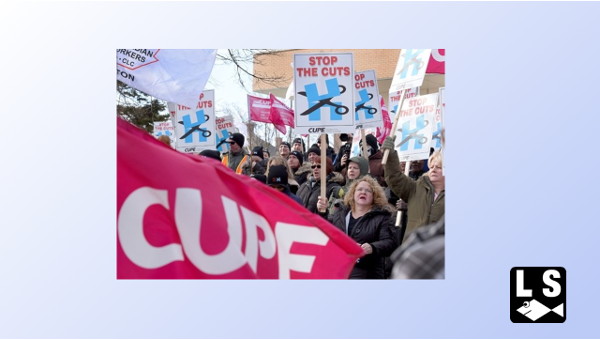 Rally to protect local healthcare will be held in Toronto on April 30, 2019. The evidence is abundant that Ontario has a serious healthcare capacity problem. Cuts and rationing have gone too far. Health funding in this province has dropped to dead last in Canada. In fact, during the election, Ford traversed the province promising an expansion – not a wholesale dismembering – of the health system. But what is in Ford’s healthcare omnibus bill is a new “super agency” forged out of 20 existing agencies with widely disparate mandates, histories, levels of effectiveness, and cultures. That alone is a mega-merger which carries a great deal of risk for vital patient care services. Written in the new law are vast powers that the Ford government has given itself and its political appointees in the new “super agency” to effect a wholesale restructuring of our local hospitals, long-term care, home care, community care, mental health and so on. Restructuring powers are defined in the legislation as not only “service coordination” but also more ominously, mergers, amalgamations, transfers of all or part of a service, closures of service, and shutdowns of entire service providers. These are not simply voluntary. They can be ordered by decree of the minister or the government’s appointees in the super agency and they also can be coerced through use of the Agency’s funding powers. Already the attention of every CEO and manager in the health system has turned to restructuring. The reality is that the large and ambitious will seek to expand their “market share” and profits using the new opportunities afforded in this legislation. They were the prime beneficiaries of the hospital mergers and restructuring under the Harris government in the late 1990s. 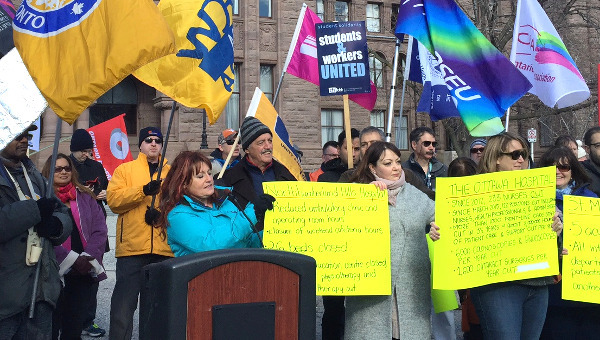 Today, largely as a result of that round of health restructuring, public hospital services were transferred to for-profit long-term care and home care. The Provincial Auditor reported in 1999 that the last hospital restructuring that occurred under Premier Mike Harris from 1996 to 2000 cost $3.9-billion to lay off nurses and staff, close down local services, then rebuild them elsewhere. The final “savings” was $800-million. Yes, that is correct: they spent $3.9-billion to cut $800-million. In Doug Ford’s new round of healthcare restructuring, years of mergers and takeovers and partnerships and so on are supposed to result, according to the current minister, in 30 to 50 giant healthcare conglomerates running virtually all services for up to 15 million Ontarians. Each conglomerate would be made up of hundreds of mergers, service transfers and takeovers, but also some separate entities: 1,800 service providers are to be pushed into these groupings. Each conglomerate will need a new tier of administration to run the relationship between its various parts. That equals 30 to 50 new administrations plus the mothership “super agency.” The administration of the conglomerates will be owned by the providers themselves in their interest, not public oversight in the public interest. This is worse than what already exists. Virtually all the democratic protections, paltry as they were in previous legislation, have been stripped out of the new omnibus bill. There are no principles at all to guide restructuring, no mention of equity, no open board meetings for the super agency, no appeals of restructuring decisions, no requirement for public input or democratic process. There is no evaluation system for the vast new restructuring. There was no public consultation prior to this Bill. In fact, the first job of a public healthcare system is to measure and plan to meet the population’s need for care. But the Ford government’s new healthcare omnibus bill does not require the super agency (or anyone else) to actually do this. This article first published on the Huffington Post website. Natalie Mehra is Executive Director of the Ontario Health Coalition.